We are pleased to present this guest post by Clare Moorhouse, Search Manager for Torpedo Group in the UK, named one of the top B2B marcomms agencies in 2012. Read on for ways you can set yourself up for lead-gen success. Lead generation is the lifeblood of any business. Yet many companies struggle to capture, manage and convert meaningful leads for their business. Effective B2B lead generation requires strategic planning and persistent monitoring. 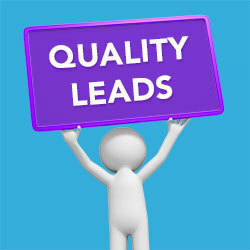 Whatever type of B2B lead generation campaign you are planning, the basic principles of generating quality business leads remain the same. In this post, we’re going to cover ten important questions you need to ask before you embark on any lead generation campaign, to ensure you get the results your business deserves. 1. Has your campaign been thoroughly planned? Are you putting your campaign out at the right moment, in front of the right person and with the right message? A clear strategy and well-planned campaign means clever targeting with a much better chance of generating quality leads. 2. Is the campaign clearly targeted with a well-researched and in-depth understanding of your target market? Your starting point for any B2B lead generation campaign should be audience understanding. You could divide your market by what they do, how they behave and operate, and by their buying patterns. Just make sure you are absolutely clear about who your ideal customer is. 3. Does your database contain accurate, up-to-date data? Ensuring your database contains the most current data is crucial; you will need to contact the correct people at the right level. Validated and well-managed data should be a top priority so your message lands in front of the right person. 4. Have you set critical performance indicators to measure the success of the campaign? This needn’t necessarily be a monetary ROI. Click-throughs, voucher returns, social shares, incoming enquiries or sign-ups are all effective ways to measure the ROI of a campaign. It’s important to set up metrics from the start in order to analyse the success of the campaign from day one. 5. Are you using intelligent and creative content that engages with your audience? Businesses are now realising the power of content, but the real challenge is deciding what type of content best engages your audience. Online videos, white papers and how-to guides are all common tactics for B2B marketing. 6. Does the campaign align with your overall marketing strategy and integrate with other marketing initiatives you’ve got planned? Make sure your lead generation aligns with other campaigns you’ve done in the past, or have planned for the future. Your campaign may need to integrate with secondary or even multiple marketing channels to support and reinforce your message. 7. Is the campaign tried and tested? Always allow sufficient time to test your campaigns, and where possible, set up multi variant testing of the same campaign running side by side to measure which message is delivering the best conversions. 8. Does your campaign include strong calls to action that are easy to follow and measure? Is it clear from the campaign what you want your audience to do? Often readers only scan a message, so be sure that it’s both clear and compelling about what action you want them to take. Make sure you have the systems and reporting in place to measure the results of your efforts. Tracking cost per lead is one indicator of success, but measuring the cost per sales opportunity is also a valuable ROI indicator, as lead generation is about “harvesting opportunity” not just short-term wins. 9. Is your creative brief clear? A brilliant creative concept is what’s going to grab audience attention, keep them engaged, and entice them to take action. This all starts with providing your agency with a full and clear creative brief that takes into account time, resources and available budget. Getting the most from your Creative Agency means preparing a detailed brief that includes what you want to achieve, your target audience, unique selling proposition and a central marketing message. The more detailed the brief, the better targeted the creative concept will be. 10. What’s your lead nurturing strategy? After all the hard work spent planning and implementing your campaign, it’s often all too easy to lose contact with those prospects you’ve worked so hard to attract. A clear follow-up and lead nurturing strategy will ensure you continue a meaningful dialogue and build trusted relationships with the people that matter. As with all marketing campaigns, better preparation will lead to better results. With that in mind, identify precisely the aims of the campaign from the outset and follow the guidelines within this article to achieve optimum results and a better response. About the author: Clare Moorhouse is Search Manager for Torpedo Group, a B2B creative marketing agency. Torpedo provides bespoke B2B lead generation services integrated across digital, print, event and social channels. Contact Torpedo to find out more. Veterans Day is a United States government occasion watched every year on November 11, respecting and recollecting each one of the individuals who have served in the United States Armed Forces. Kudos ! thanks for sharing such an interesting information in a gentle manner. More over this site earned fine Alexa traffic rank. Keep it up and all the best. Brother Printer Customer Support & assistance for all the issues & get an instant fix by Professionals. Learn how to set up and use Brother Printer. Find all the points, sources, and contact options you need for Brother Printer at Brother printer tech support 1800-970-8380. About the author: Clare Moorhouse (https://www.checkthem.com/name/Clare-Moorhouse/) is Search Manager for Torpedo Group, a B2B creative marketing agency. Torpedo provides bespoke B2B lead generation services integrated across digital, print, event and social channels. Contact Torpedo to find out more. norton.com/setup - Learn here how to download, install, and activate your Norton setup on your computer and other devices. Go to www.norton.com/setup to activate your Norton product using the 25 character product key. That is a very interesting article on b2b lead generation. Visit our website to learn more about we can help you successfully launch it! Dear Author Great! Pretty informative, look ahead to coming back again. Office.com/setup - Read on to know how to purchase, download, reinstall, install, uninstall and activate Microsoft Office setup for Microsoft office product. hank you ever so for you article post.Really looking forward to read more. I know that you put much attention for these articles, as all of them make sense and are very useful.